The Italian tradition of 'Aperitivo' is a relaxing cocktail or glass of wine and a light, casual snack before dinner with friends. 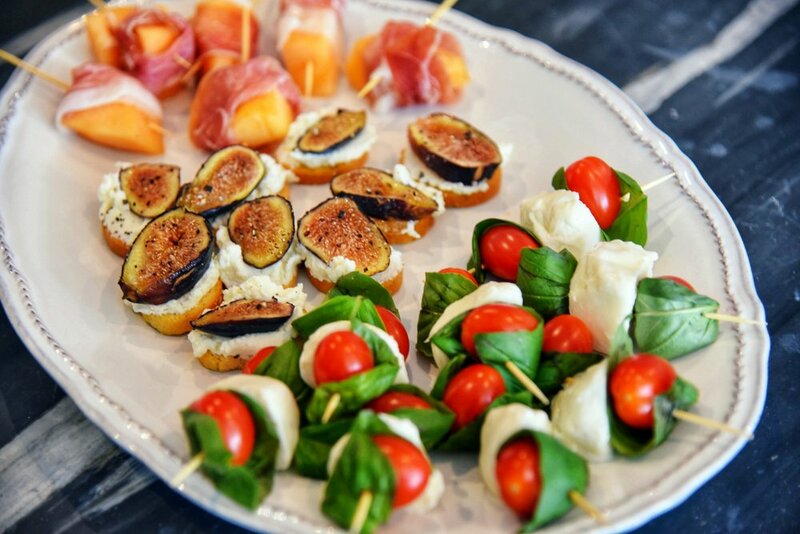 An Aperitivo party is such a special way to celebrate the simple pleasures of the day and it's all about bringing people together in the spirit of leisure and conviviality--- in the Italian love language, which is of course food and wine! It's the perfect excuse to gather your crew this summer, and a truly easy event to pull off if you follow our guide. Salute! The inspiration behind this cocktail is the summertime flavors of Italy: basil and citrus! (We wanted to do something a little more original than the Aperol Spritz--- although it's very traditional for an aperitivo party, it's been ubiquitous these past couple of years and why not do something different and memorable?) As a party kickoff, sparkling wine was an essential component to this cocktail and Mezza di Mezzacorona Brut (made from a blend of Pinot Bianco, Chardonnay and Muller Thurgau grapes) added just the right amount of freshness and zip. For your antipasti, focus on crowd pleasing bites that are simple, fresh, and easy to assemble. Our inspirations were designed to be served room temperature, so you can ‘set it and forget it’ and enjoy your own gathering rather than be tied to the grill the whole night... and most importantly: they're perfect with wine! Caprese Skewers: simply thread mini mozzarella balls (aka bocconcini) with cherry tomatoes and fresh basil... drizzle with olive oil if desired! Fig and Ricotta Crostini: toast baguette or ciabatta slices with a little olive oil and spread with ricotta cheese. Top with sliced fresh figs, some excellent olive oil, and fresh cracked black pepper. Prosciutto & Melon: Cantaloupe bites wrapped in prosciutto are so simple and the colors are gorgeous! Other simple bites perfect for your Aperitivo party are grilled shrimp skewers, goat ricotta crostini with acacia honey and sea salt, tomato bruschetta, and truffle mushroom crostini. Buon Appetito! Mezza di Mezzacorona Italian Glacial Bubbly ($14.99): a blend of Chardonnay, Muller Thurgau, and Pinot Bianco – made in the charmat method. Perfect for an aperitivo, with light bites, or cocktail creations! Learn more about Charmat method and sparkling wine production here. Mezzacorona Rose ($9.99): 100% Lagrein. Fun fact: Mezzacorona is the largest producer and exporter of Pinot Grigio, but they also focus a lot on indigenous varietals of Trentino like Lagrein (pronounced 'luh-GRINE'). Almost like a cross between Pinot Noir and Syrah, Lagrien makes fruity, lightly spicy wines with a light and silky texture. Learn more about rose production here. Located in Trentino, not only are Mezzacorona winery's wines affordable, but they are all estate grown, estate bottled, hand harvested, and sustainably farmed! Stemmari Grillo ($9.99): a native grape from Sicily, Grillo is a fresh a bright white wine that has a medium bottle and a rich minerality. It's a wonderful pairing with all things seafood! The winery is located in Sambuca di Sicilia, in the province of Agrigento, about 90km south of Palermo. Stemmari Rose ($9.99): made from Sicilian native grape Nero d'Avola, this is a concentrated and very fruit-driven rose that is easy drinking and very food-friendly. 'Living Sicilianly’ is Stemmari’s way to show how the foods, flavors, and wines represent the essence of Sicily and its people. Rotari Brut Rose ($19.99): part of the super-hot-right-now Trentodoc region, this luxurious sparkling wine is made of 75% Pinot Noir & 25% Chardonnay, Rotari is made in the metodo classico – just like Champagne, just not in Champagne! The chalky, limestone rich dolomitic soils imparts fresh, crisp, acidic characteristics to the wine. On your invites, encourage your guests to ‘dress Italian’! Who wouldn’t love channeling their inner Sophia Loren in glam fashion? You don’t have to be in Positano to create some killer photo opps if your guests are dressed the part. This retro-chic collection of Italian cocktail music we curated means: instant vibe! Listen, download, and enjoy! Special thanks to Mezzacorona, Stemmari, and Rotari WInes for sponsoring this post!